And yes, they kiss. No will-they-won’t they any more! 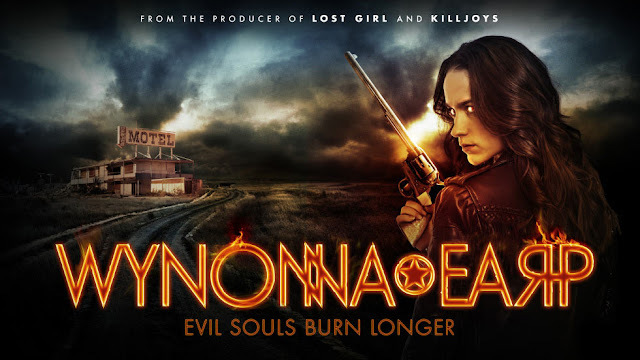 Convenient and slightly clumsy plot points also apply with Wynonna and Willa remembering about a letter that their father hid with Bobo has been looking for. It’s a letter that conveniently tells everyone all about the Earp curse and how to break it, and how to free the Revenants from the triangle left by their dear old ancestor. How does Bobo free his fellow Revenants? By having an Earp heir willingly cross the boundary with him. Well that sounds rather hard to achieve; especially as we focus on the red herring of the episode and Bobo’s apparent plan to poison an entire hotel full of party goers (finding this out involves Doc’s convenient escape and appearance – just in time for him to see Dolls and Wynonna kiss – as well as questioning the judge who commits suicide to get out from under Bobo’s thumb and dealing with Waverley’s homophobic ex. Which Nicole does, awesomely) all dressed to the nines. Naturally including Wynonna rocking a red dress. But twist – Willa meets Bobo outside and walks away with him. She has some more of her memories back – and it looks like she and Bobo were involved. Willa, the true heir, is likely willing to cross the boundary willingly with Bobo. Now there’s a twist. But where can they go with this? In the very little time we have left this season, what can they do with this plot line?